﻿Siblings Day: Calendar, History, Tweets, Facts, Quotes & Activities. 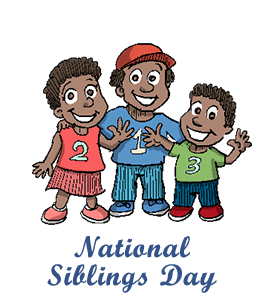 National Siblings Day serves to celebrate and recognize the importance of brothers and sisters. The bond and relationship between brothers and sisters is unlike any other as it is usually a person's longest relationship over his/her lifetime. National Siblings Day was created by Claudia Evart, a New Yorker who lost both of her siblings. It is celebrated annually on April 10, a day that marks the birthday of Evart's late sister, in an attempt to strengthen family ties and recognize the special gift of siblings. National Siblings Day has been celebrated since 1998 in 49 of the 50 United States. It is not officially a nationally or internationally recognized holiday but the Siblings Day Foundation is working to change this. According to the Guinness World Records, officially, the most children birthed by one mother is 69. In China there was a one-child policy untill 2015, which means it restricted urban families to having only one child. For 35 years, it was illegal to have siblings in China. According to the Guinness Book of World Records, the oldest family in the world is the Tweed family. The 7 brothers and 5 sisters vary in age from 76 to 96 for a combined age of 1020. Watch a movie about the importance of siblings and family such as Elf (2003), The Good Dinosaur (2015), The Chronicles of Narnia (2005), Lilo and Stitch (2002), Little Women (1994) or Finding Nemo (2003). Post a picture or a memory of you and your siblings on social media and tag all of your siblings. Write a caption that recalls a fond memory between all of you. Attend the National Sibling Leadership conference in Louisville, Kentucky. This will help directly support National Siblings Day and hopefully one day make it a nationally-recognized holiday. Use the hashtags #NationalSiblingsDay, #NSD or #brotherssisters on social media to help spread awareness. Gather with your siblings, take an old photo album and recreate your childhood photos as adults. Give the finished photos as a gift to your parents.